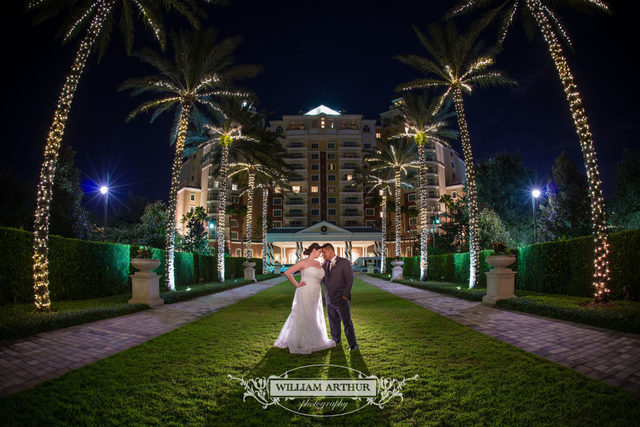 Cassidee and Rene celebrated their gorgeous holiday wedding at Reunion Resort and we were thrilled to create the floral designs for their dazzling and romantic day. 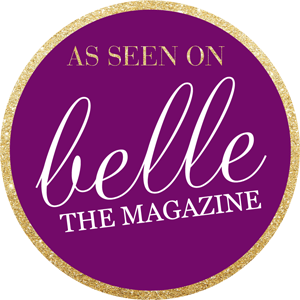 Blush by Brandee Gaar did it again by planning and coordinating a simply stunning event for the wedding party and guests alike to enjoy. 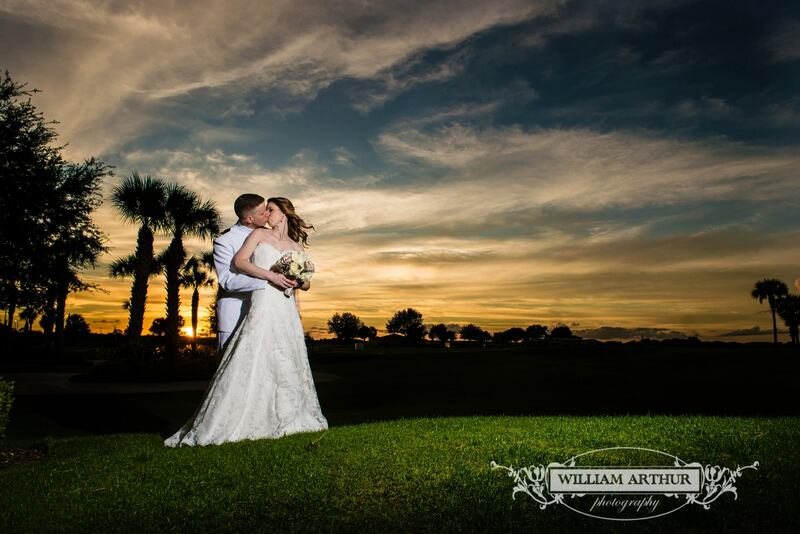 William Arthur Photography beautifully captured all the details of the intimate affair. 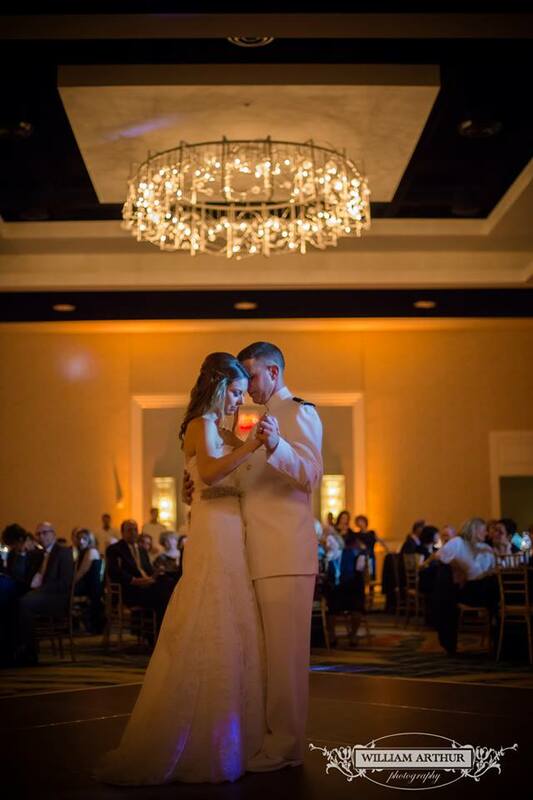 We love how the bride chose a simple yet dramatic color scheme for her big day. 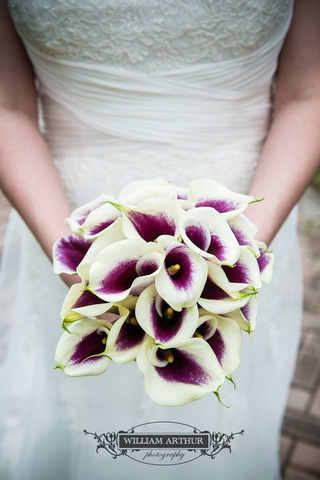 Cassidee carried a striking bouquet of all purple and white Picasso Calla Lilies, which popped against her white, lace embroidered gown. 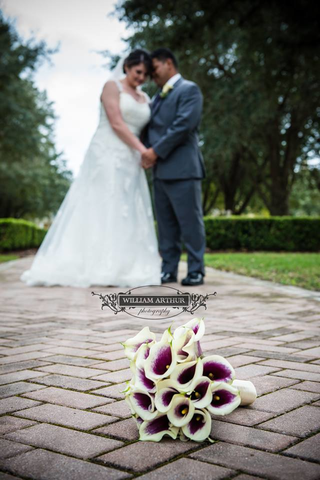 Rene donned a single white Cala Lily boutonniere to match his bride’s bouquet. 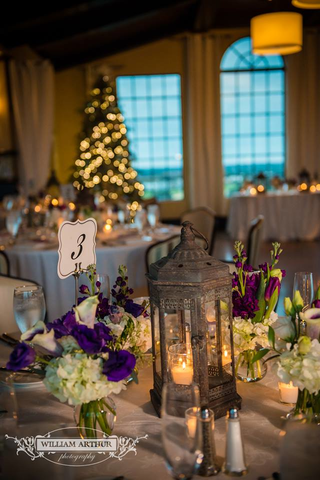 Inside, the reception warmly welcomed guests with flickering candles and romantic dimmed lighting by Soundwave Entertainment. 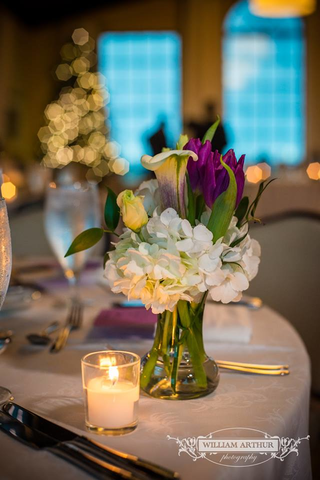 For the centerpieces, we designed arrangements of hydrangeas, white roses, violet tulips, and Calla Lilies to create texture and dimension with their lush and rich tones. The soiree was filled with opulence and decadence. 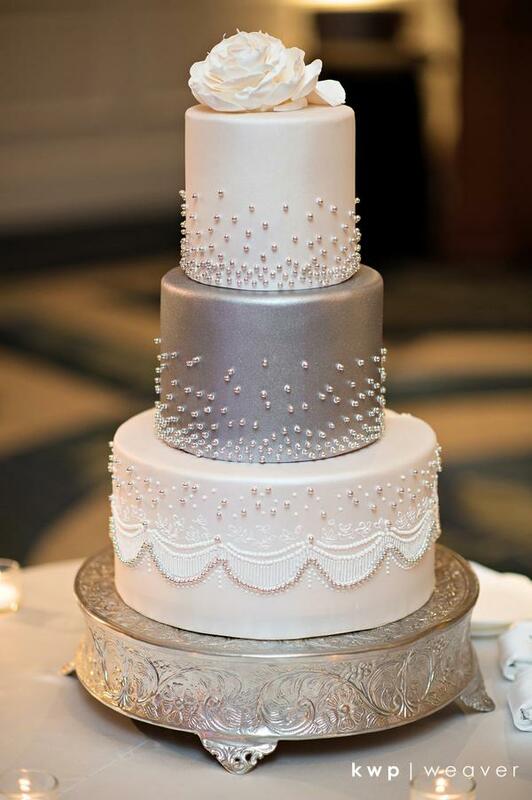 Guests enjoyed a champagne toast to start the night, and later were able to treat their sweet tooth cravings with a delectable buttercream cake. Party Flavors Custom Cakes designed the two-tier confection with intricate floral detail piping, adorned with an oversized deep purple fondant bow, cascading down the tiers. 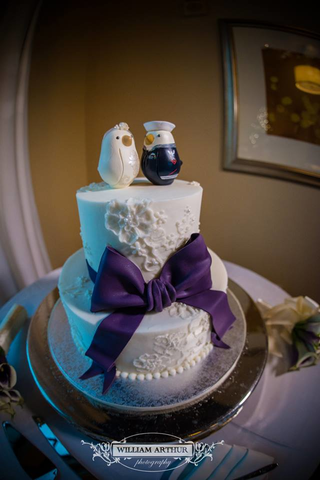 Bride and groom “love birds” perched adorably as a cake topper. 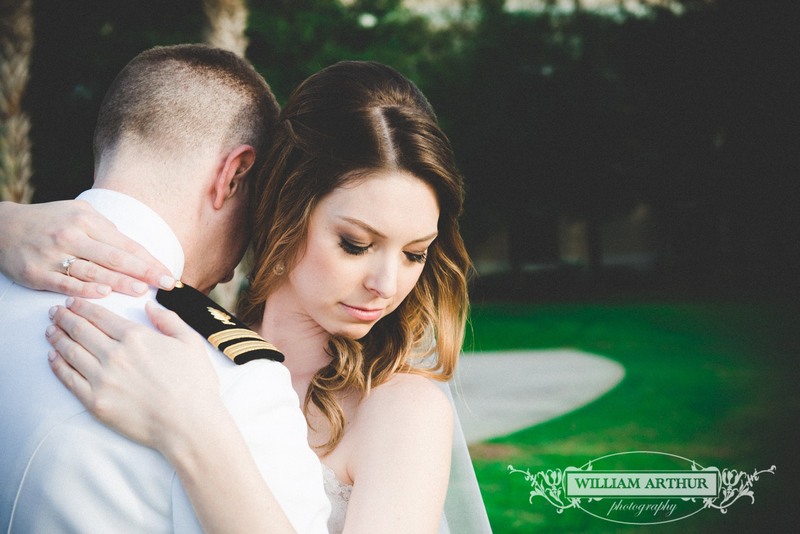 We never get tired of seeing the beauty and love that surrounds a wedding day. 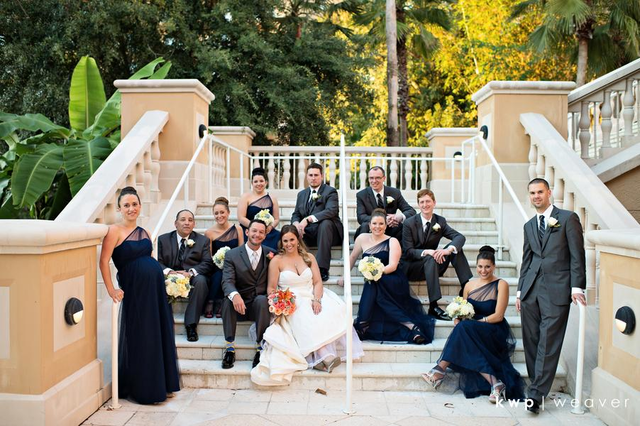 Marianne and David wed at Omni Resort at Champions Gate surrounded by the love of family and friends. 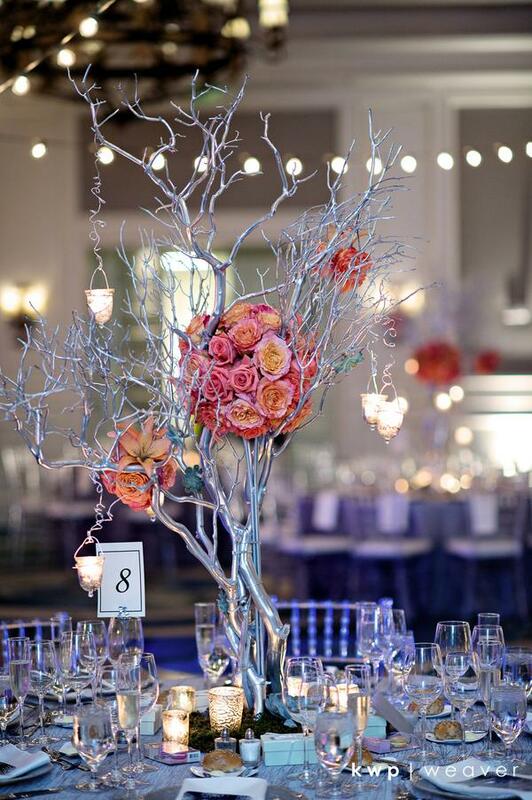 Blush by Brandee Gaar provided the beauty and elegance by planning and designing this spectacular event. 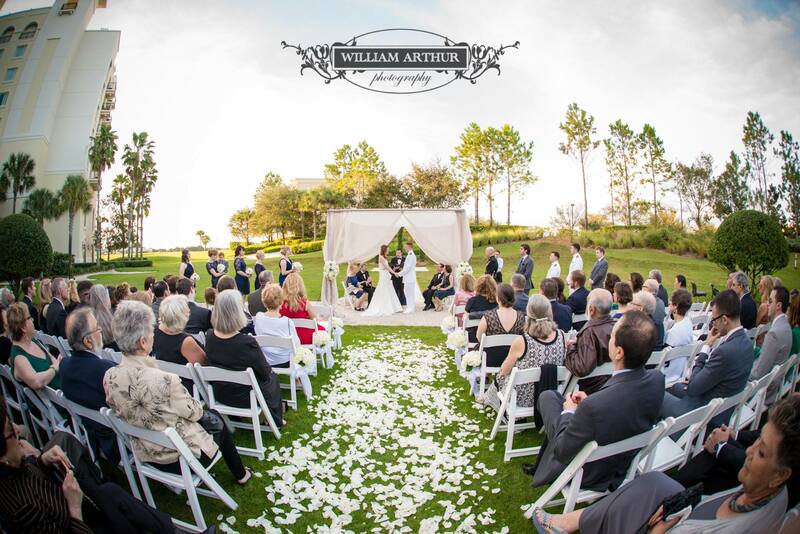 The details of the day were artfully captured by William Arthur Photography. 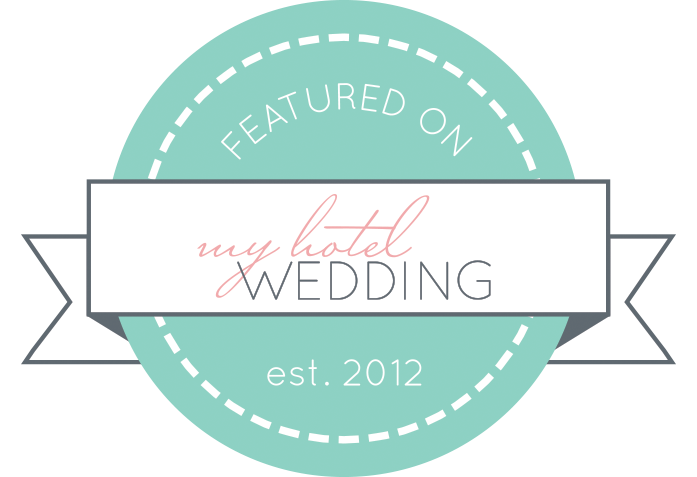 For the outdoor ceremony, the stunning bride walked down a rose petal covered aisle in a white, strapless lace gown. 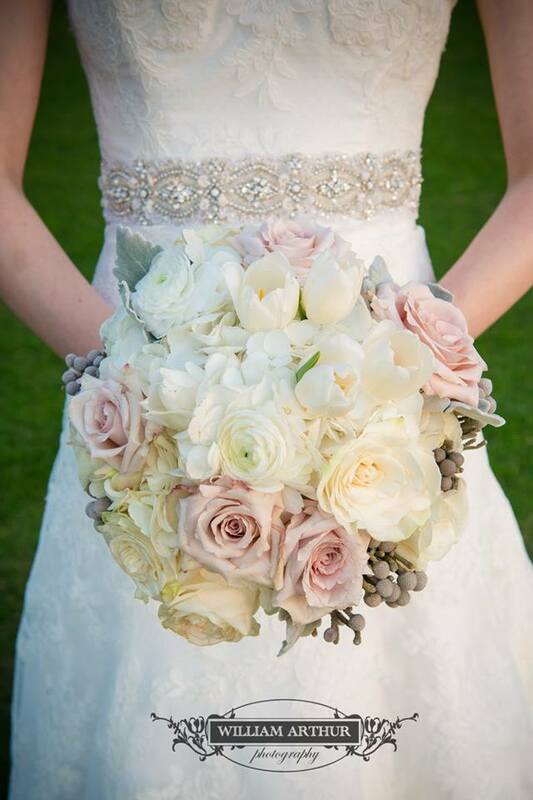 She carried a beautiful bouquet of dusty pink and cream roses, white tulips, hydrangeas, and ranunculus. 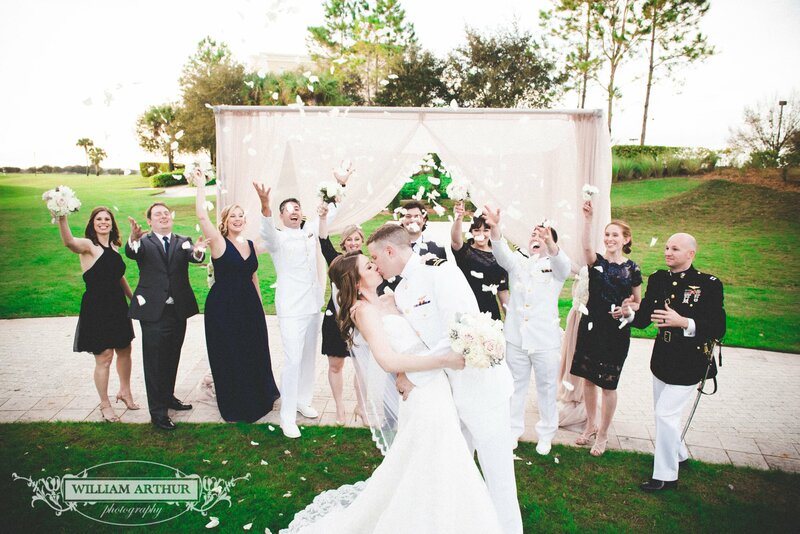 Her groom waited for her in his United States Navy dress whites, under a canopy veiled in blush chiffon, and tied back with the same lush floral arrangements. 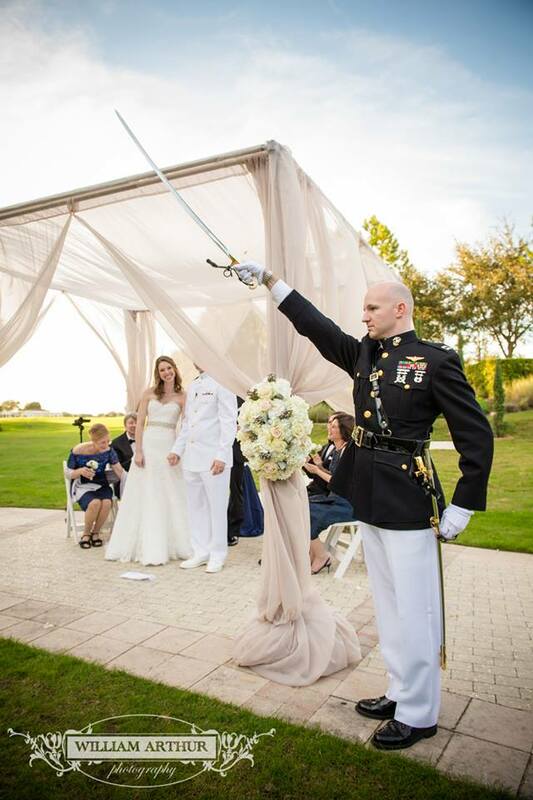 To honor his service to our country, the ceremony was complete with a military salute. 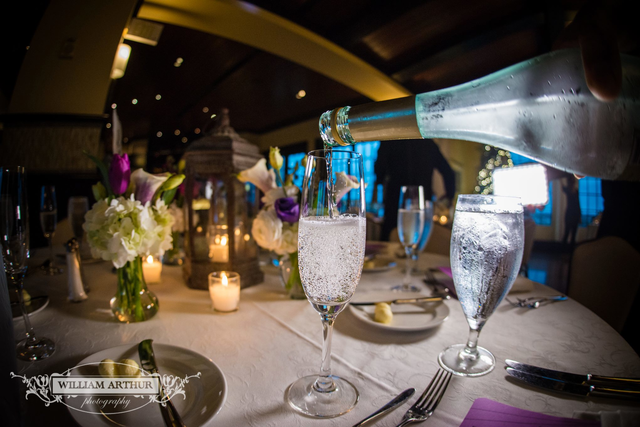 Guests were welcomed into the reception with romantic ambiance by candlelight and strategic uplighting by Soundwave Entertainment. 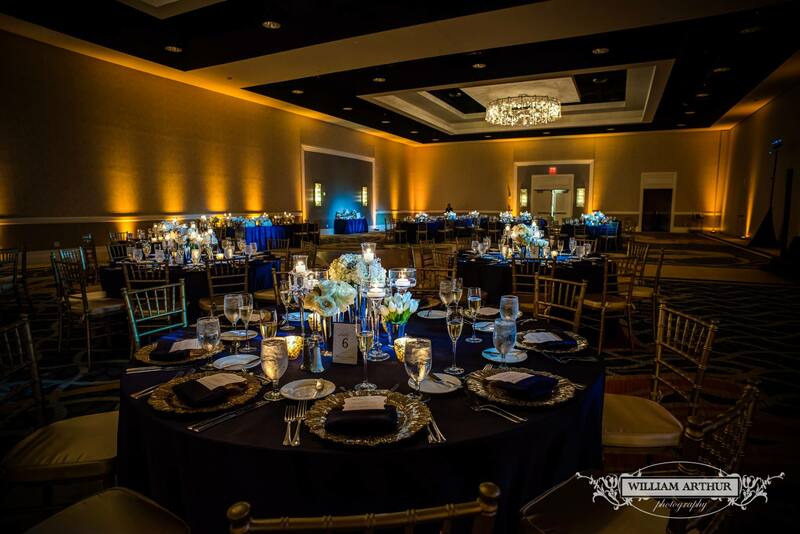 Navy blue linens draped over round tables, tucked inside a circle of gold Chiavari chairs. 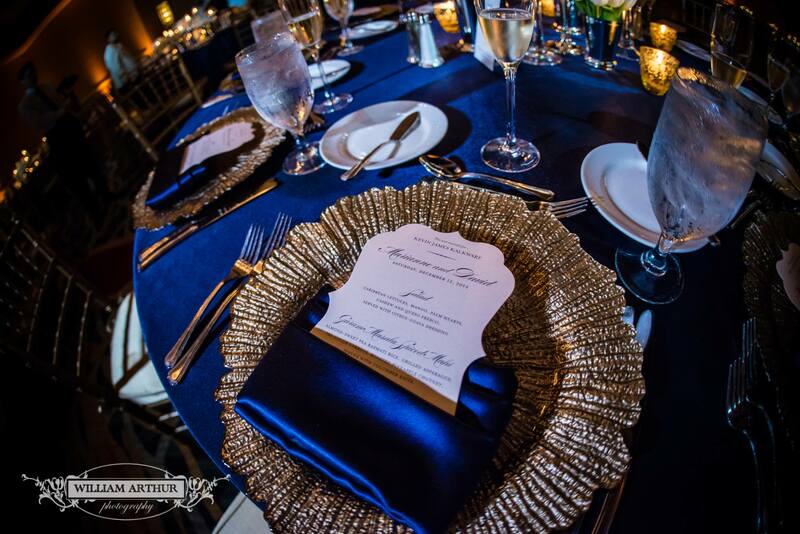 Golden, textured chargers from A Chair Affair brought the drama to the elegant affair. 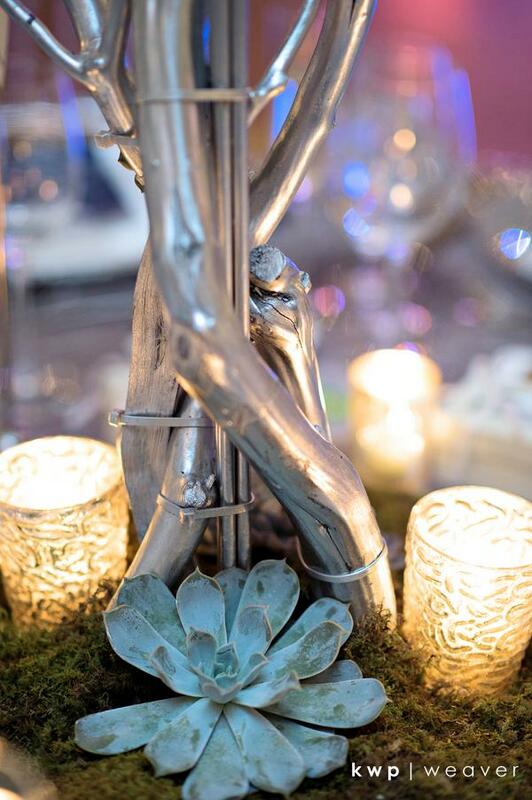 We loved how our centerpieces tied the entire tablescape together. Silver vasses of white tulips, roses and hydrangeas clustered amongst varying candelabras, creating a balance between regal simplicity and classic elegance. 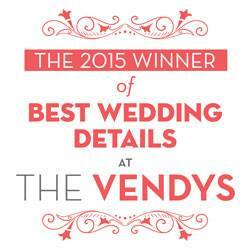 We love when couples personalize their wedding day. 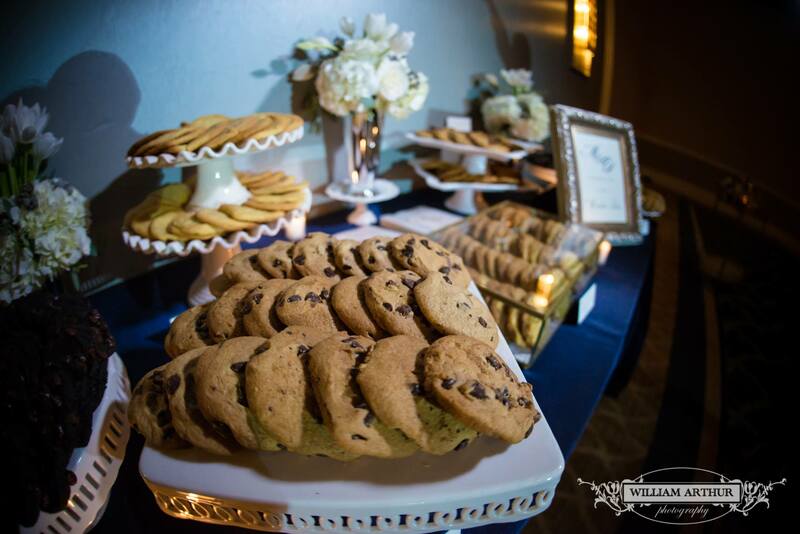 What a fun idea for a dessert bar complete with everyone’s favorite sweet treats from Two Sweets Bake Shop. 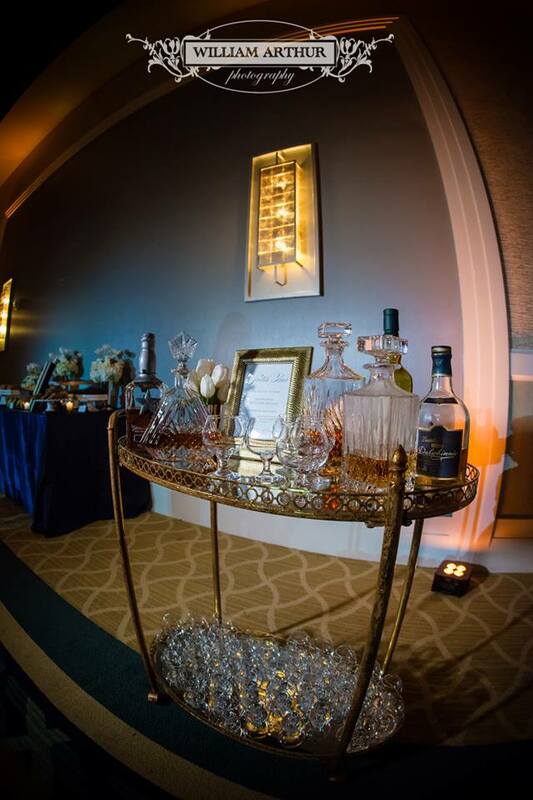 And if you had a hankering for a neat drink to close out the evening, the fully stocked scotch bar (yes, you read that correctly) was the perfect night cap. 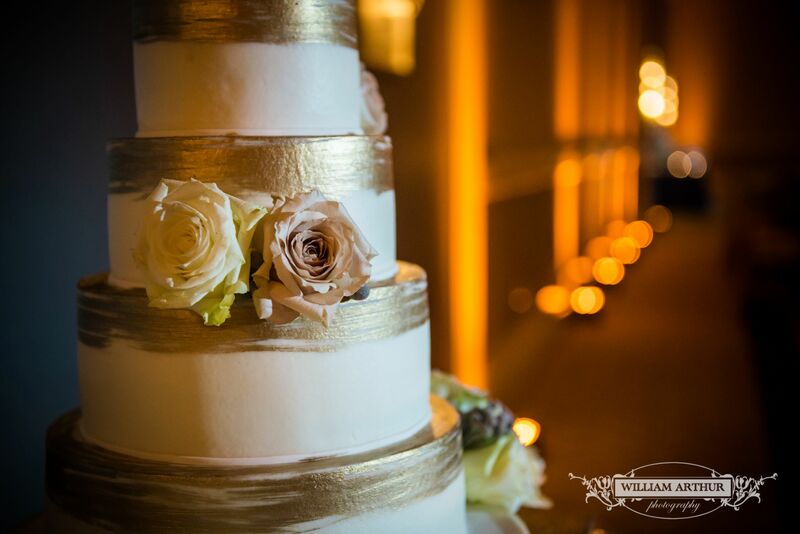 To top it off, Party Flavors Custom Cakes created simply stunning four-tier buttercream cake, dusted with edible gold detail. We had a fantastic time working side by side with this distinguished team of wedding professionals for Marianne and David’s wedding day. We wish you both health and happiness in your new life together! When he proposed under the 4th of July fireworks, David and Julie both knew they wanted to incorporate that night into their wedding day. 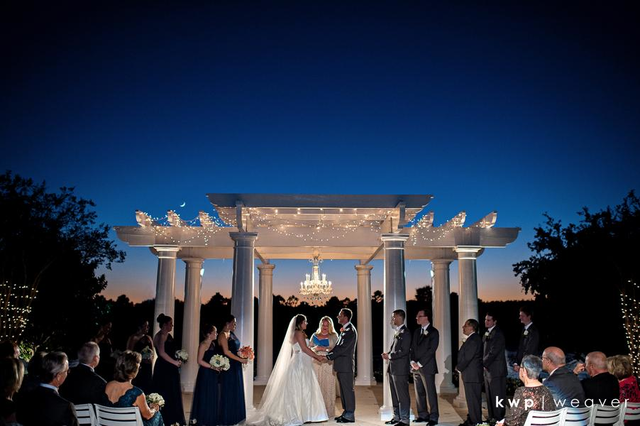 As the sunset overlooked the water at Ritz Carlton Orlando Grande Lakes, the couple exchanged vows and said “I Do.” Blush by Brandee Gaar planned a spectacular event accented by navy blue, orange, and silver, and Kristen Weaver Photography captured the entire soiree from sun up, to sun down. 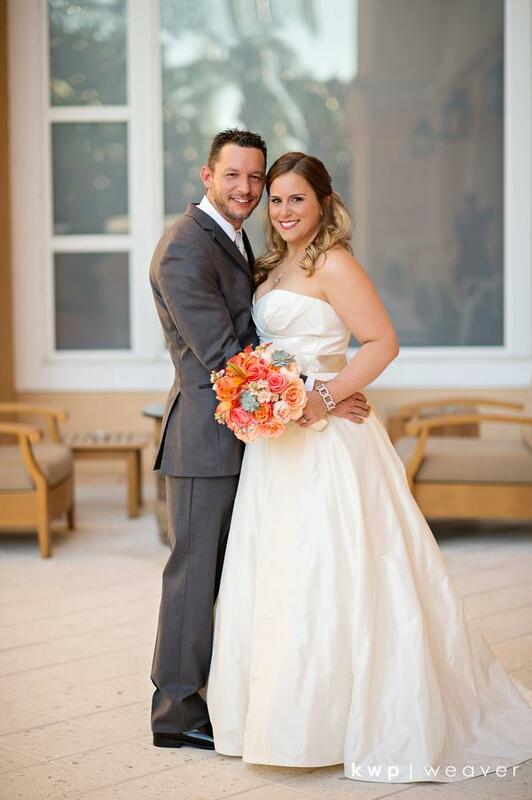 We loved creating a bridal bouquet that popped with color against Julie’s white, flowing gown. We mixed peach and pink roses with orange lilies, and added fresh succulents for a modern feel. For the bridesmaid we kept it classic with all white bouquets of roses, hydrangeas and mini succulents. 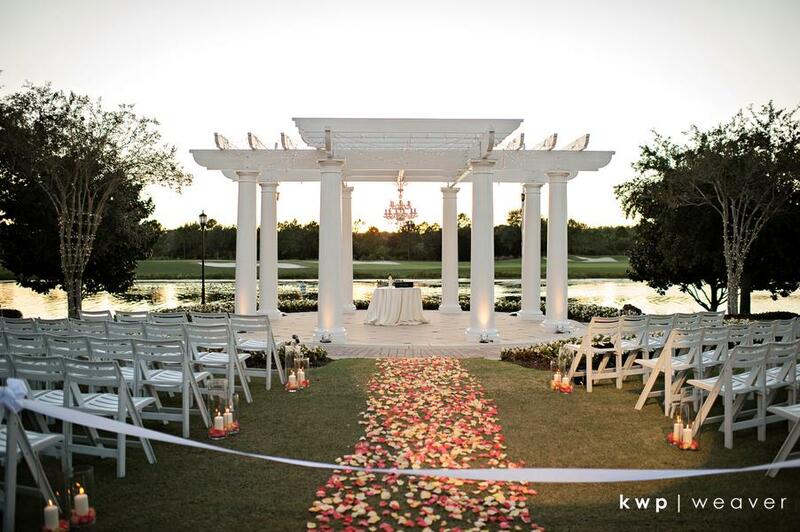 The outdoor ceremony was magical! We loved how the center aisle, scattered in peach and cream rose petals, led the way to her groom at the front of the alter. After their first kiss as husband and wife, a showering of fireworks lit up the night’s sky over the lake–just as it did on their proposal night. 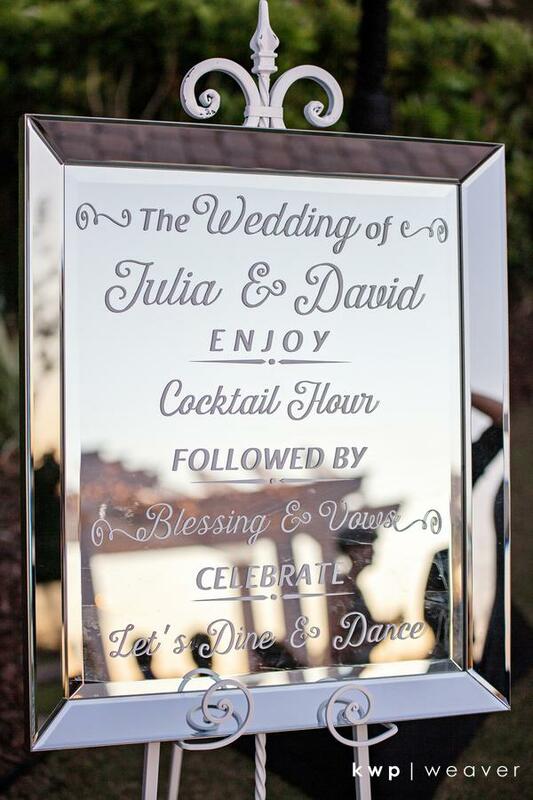 Chalk Shop created a beautiful mirrored sign etching out the night’s events. The mood inside the reception was set to party. Cafe lights from Kaleidoscope Event Lighting and Design were strung across the ceiling while silver plated tree centerpieces took the spotlight. 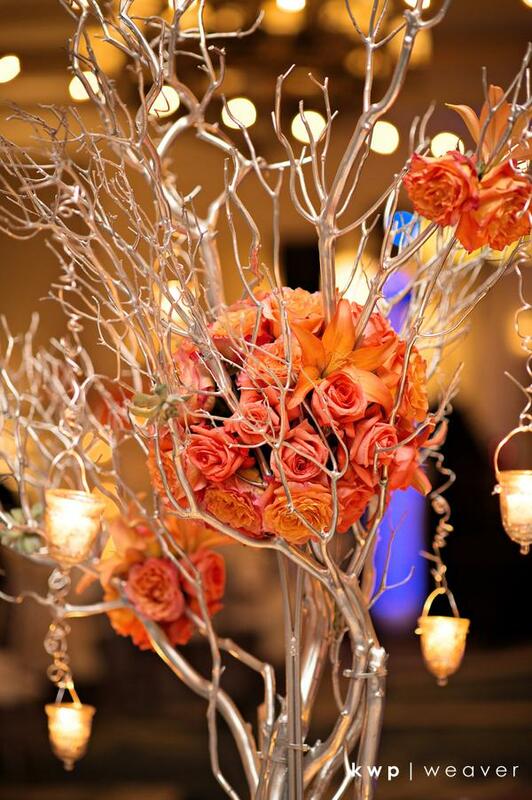 We loved incorporating arrangements and clusters of orange roses and lilies through the branches. And because we leave no stone unturned, the bottom was covered in a layer of moss and finished with frosted candle votives and succulent buds. The party raged on into the evening as The Leonard Brothers cranked out the tunes and guests danced the night away. 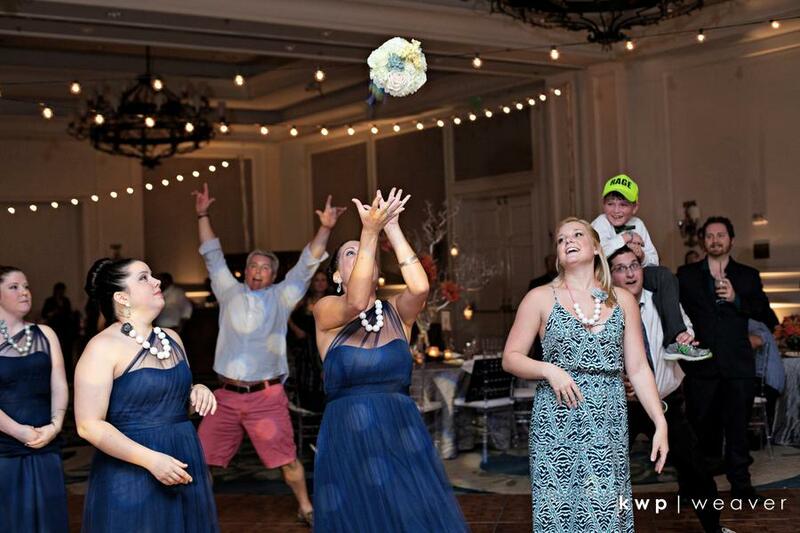 We had a blast working with Julie and David and all the vendors to create this one-of-a-kind, fun and enchanting wedding. 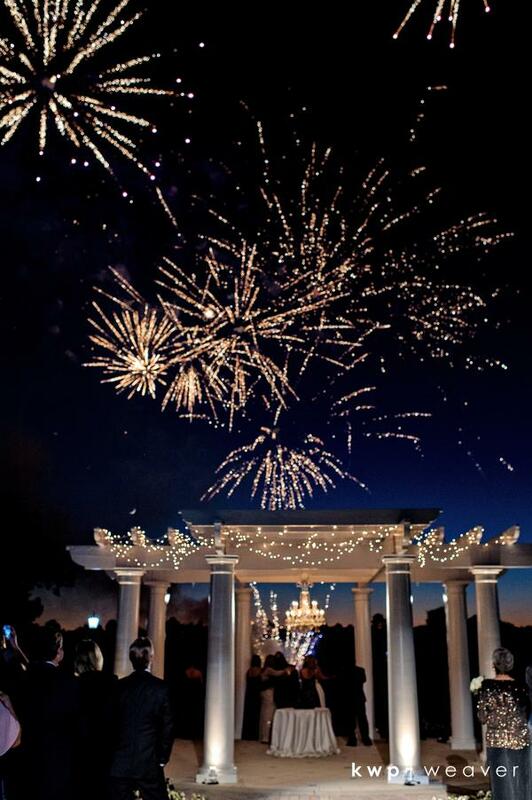 Cheers to a lifetime of fireworks for the happy couple!